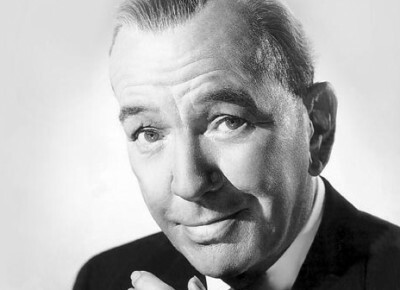 Noël Coward wrote his “improbable farce in three acts” in less than one week during the Blitz, having taken himself off to Portmeirion when his office and adjoining flat were destroyed. Blithe Spirit tells how author Charles Condomine invites Madame Arcati, a medium who lives in the same village, to conduct a séance in the presence of his wife and other dinner guests so that he can research his latest book. 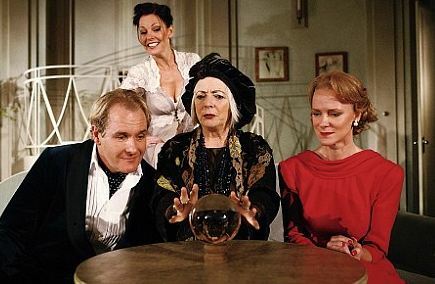 Charles has hopes that the medium will expose a few “tricks of the trade” to fuel his own scepticism, so he is horrified when the spirit of his first wife, Elvira, arrives on the scene. Only Charles can see or hear her – and the audience, of course – and this leads to some hilarious misunderstandings as his present wife Ruth is convinced he is ranting at her. But despite the apparently innocuous banter, Elvira is in deadly earnest; she wants her man back and, having discovered that she still has a hold on Charles, sets about arranging his death so that he may join her on “the other side”. Meanwhile Ruth has metamorphosed into a jealous, distraught harridan as she witnesses the effect of this blithe spirit on her husband. When Elvira’s attempt to murder Charles misfires, he finds himself haunted by no less than two spirit wives who have improbably joined forces. Only Madame Arcati can solve the mystery of their manifestation and it is she who returns them to whence they came with some unexpected assistance. The part of Charles was originally played by Noël Coward himself; there are also marvellous roles for women in Blithe Spirit, which is one reason why it is such an appropriate choice for our group, and we relished the opportunity to savour its witty repartee. With such wickedly accomplished dialogue throughout – although it was felt that some of the scenes between Charles and Ruth would have benefited from judicious cutting – a reading still provides a highly entertaining experience. We thoroughly enjoyed our annual excursion into writing for performance. Next month we shall be discussing Cloud Atlas by David Mitchell on Thursday, 19th February.